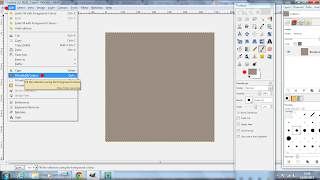 This is a very basic, tutorial on how i edit pictures in gimp. It may not be the best way, there could be easier ways but this is how I do it. 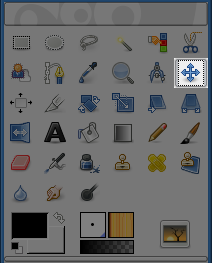 I use Gimp 2.6. because it is free. There is a newer version but i don't like it. So lets begin and open Gimp. (click pics for bigger view). Make sure you have your tool box and layer/channels box open at the side. So click New. A template box opens up. Put in your dimensions. If you are just doing one headshot picture go ahead and make it 512x512 but for the headshot and long shot presentation i enter 700x700 and re-size it when i'm done. Ok, so click on Edit and Fill with background colour. I usually make it brownish or grey but whatever you like. Some people use the ultra green background but i hate it, because i don't have time to edit tiny bits of green out of a sims hair etc! You can just use white if you are pasting onto a white template. 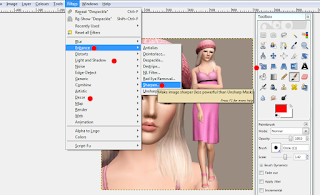 So click File>Open and go to your Myfolder/ElectronicArts/Sims3/Screenshot folder and select the sim you wish to edit, which will open in a new image. You can minimise the other one if you wish but do not close it as obviously we will be pasting our sims on this background. 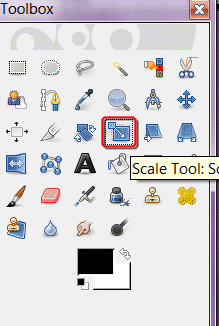 So on your sim picture you just opened we want to erase the background behind it, first crop around the sim to make it easier by selecting the first tool in the tool box (the square) and start in the corner and drag across the sim, So in the tool box select the wand tool (top second last tool with yellow tip (see below). 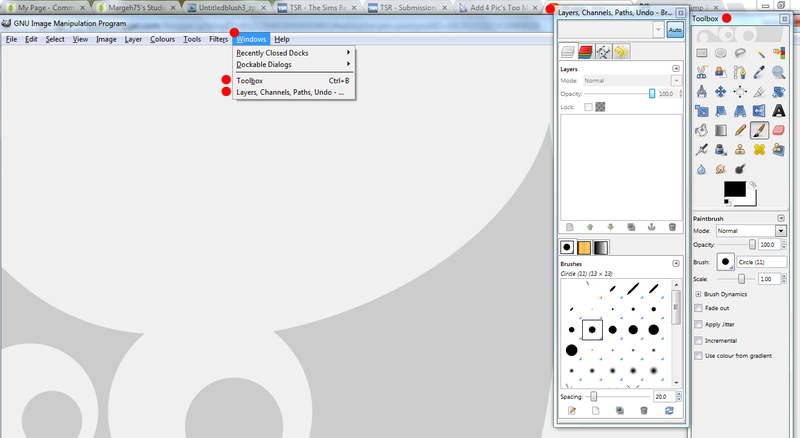 With your mouse select layer>Transparency>Add Alpha Channel. (see above with the red dot guides) Then with the wand, click anywhere in the background of your sim, (NOT ON YOUR SIM) you should see dotted lines around the edge surrounding your sim, then click Edit and Clear, then there should be a checkered grey background behind your sim (see pic below). You will still see the dotted line around your sim, to make this go away (and you must do this) click anywhere outside the grey square. 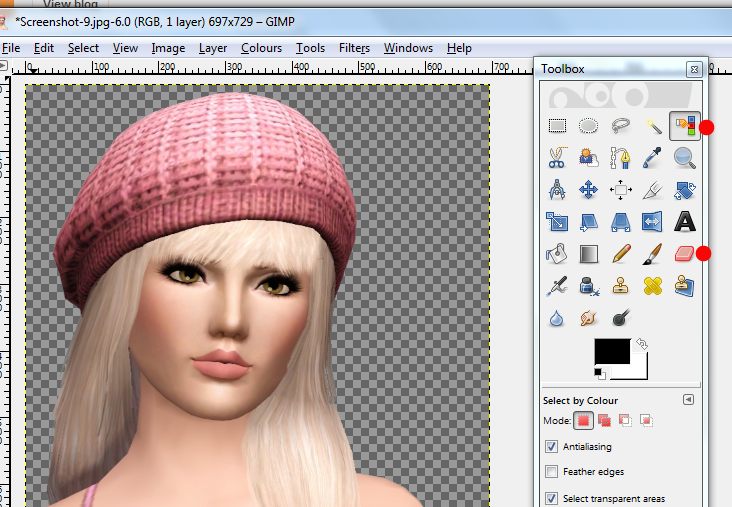 If there are pieces of background behind the hair (in mine there isn't) use the Select by colour tool top last in the tool box (a finger icon pointing atblue/red/green cubes) select the background in the hair, becareful not to select it on the sim just on the background area you need to get rid of. this selects everywhere that has the background colour. Use the eraser tool (the pink square( 5th down last across) and erase the background from your sims hair or wherever else there are still bits of background remaining. when you are happy with that again, you will still see the dotted line around your sim, to make this go away (and you must do this) click anywhere outside the grey square. You have now prepared your sim for pasting. See pic. Put it over the sim and drag to the side of your page whichever side you want it to be on, See pic below. Now after i drag my sim over and i am happy with the position again i click anywhere outside the box and the lines disappear and my sim is attached to the background. 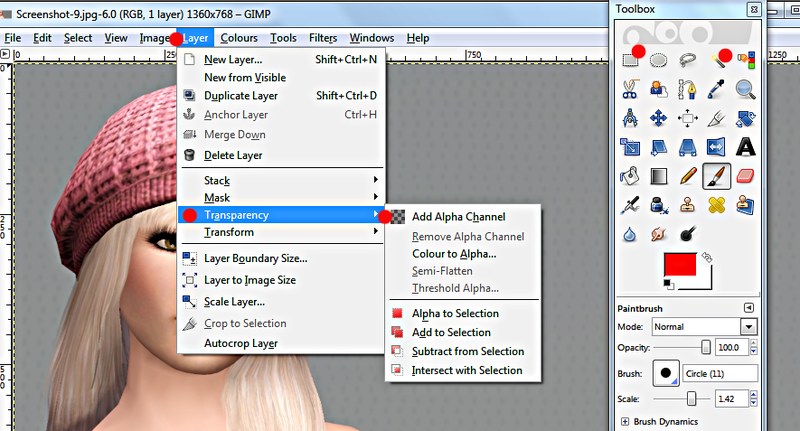 Now leave this for the time being and again in Gimp click New> and go to your screenshots folder and select the long view sim you want to paste beside the main sim above. Go through the same steps as above the whole way down. Thats all it is. 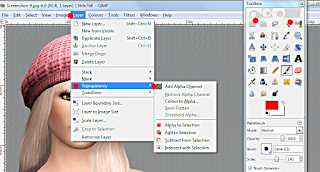 Remember because there is more of the sim to edit at the beginning , if your sim is posing with hands on her hips you will also have to click the background visible between her arm folds , leg folds, where ever, and delete these also or use the eraser tool. See below, some of my background was still barely visible. this will show up on the background, so click again with the wand tool and delete or manually delete it with the eraser tool, be careful to avoid your sim! There you go :) remember to make sure you click outside the box to snap your sim into place. 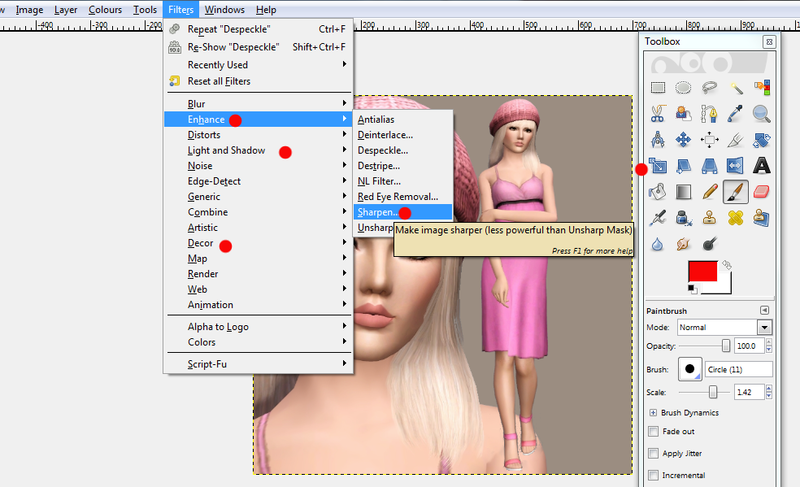 Repeat the process on other long shot sims with different outfits and paste in beside the sim, and so on. 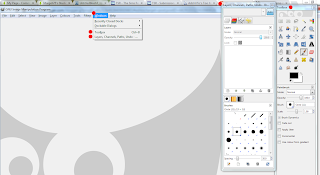 You need to look around and google where to find extra info with gimp on cool extra features that the programme has to offer like lighting, enhancing the pics, sharpening etc, its not hard though, just brows around the Filters/colours/layers tabs etc and look up what each one does. 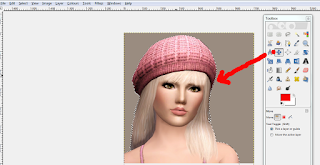 You can copy a picture from the internet and use that as your background if you wish, Just make sure the sim has a brownish or grey background though because you will get outlines around the sim if the sims background is light but the background you want to paste it on is dark. The Decor one adds a border if you wish and the capital A in the toolbox, lets you add text to your picture. And that's it! Like i said it's very basic, but its a start. It is not in-depth editing. I suggest to check Buckosnort's blog for tutorials on that. She has some neat tips and tricks for making amazing avatar pics. 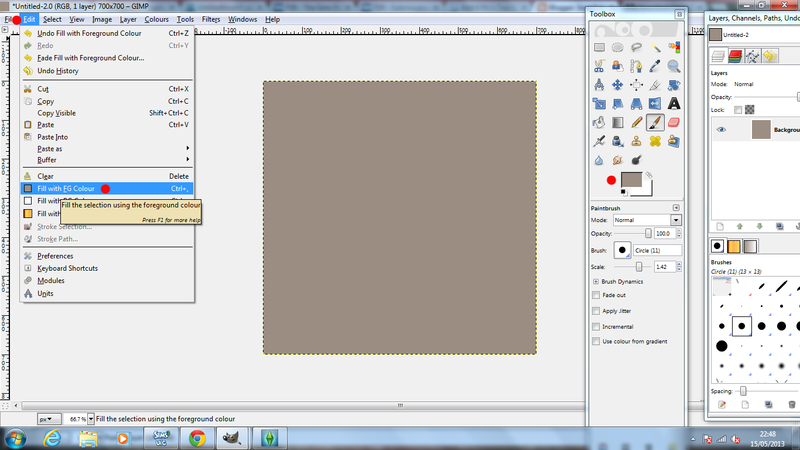 Thank you very much for the nice instructions and presentation dear Margie :) I've never used GIMP, but I can try too. I like it . Have a nice evening.